Are you thinking about using swimming to lose weight? Pool workouts can be refreshing and effective. But swimming for beginners can also be challenging. Use these tips and swimming workouts to build a weight loss program in the pool. Swimming is an excellent form of exercise for beginners because it is gentle on the body. It does not jar your bones or damage your joints, but swimming is still effective for weight loss. If you're overweight, you may be concerned about an injury or have a joint condition. Obese exercisers may have achy joints from carrying excess weight. Swimming challenges your body without putting pressure on joints. Excess pressure can aggravate some conditions, such as arthritis. Some people think that swimming may be too easy to qualify as a weight loss exercise. But swimming can be very challenging depending on how you structure your workouts. The water can serve as a form of resistance for your body, helping to tone and strengthen your muscles. Additionally, swimming improves your cardiovascular fitness and flexibility. Swimming can be done indoors or outdoors, at many fitness clubs, public pools, or YMCAs. If you do not know how to swim, adult lessons are often available at gyms or your local YMCA. Even if you learned to swim as a child, you may want to consider signing up for a class. You can learn how to more effectively work out in the pool with just a few lessons. When you take a swimming lesson, you can learn about different strokes, such as the crawl, backstroke, and the butterfly. Many people who know how to swim are familiar with a few of them, but a lesson can help you identify the best stroke for your body. There are some strokes that are less strenuous than others, which may be more appropriate if you are out of shape. If you are using a pool at a gym, you will find that you'll need to follow certain pool rules. It is important that you adhere to the posted guidelines. Many request that you shower before you enter the pool. This rule helps keep the pool water clean by removing body oils and sweat. You will find that there are also posted rules about using the lanes of the pool. This simply means that the pool is divided up so multiple people can use it at the same time without colliding. Often there are lanes for fast swimmers, moderate swimmers, and slow swimmers. If you are new to swimming, stay in the slow lane. At times, you may share a lane with one or more other swimmers. When this happens, think of it as driving on the highway. You need to stay in the appropriate lane. Find a lane in the pool where the other swimmers are similar to you. When several swimmers are using the same lane, all swimmers swim in a counterclockwise direction. Having proper equipment will help make your swimming workouts more comfortable and more effective. The most important piece of equipment is a swimsuit designed for training. Brands like arena, Speedo, Nike, Dolfin and many others design swimwear that flatters your body but also helps you to refine your stroke for better results in the pool. Arianna Vanderpool is a three-time Olympian, swim coach, and the arena Team Marketing Manager. She explains why you should buy a suit specifically for your swim workouts. “Not all swimwear is actually designed for swimming,” she says.“Straps, backs, seams, and fabric can make or break whether a swimsuit is actually comfortable or functional enough to be active in. Sun, salt water, and chlorine can also make a swimsuit fade, stretch, and become less comfortable over time. Swimcap. A cap not only protects your hair but it helps to streamline your body in the water. Googles. You may have to try on several brands before you find a pair that fits comfortably without fogging up during swim workouts. Kickboard. Many community pools supply kickboards that you can use to focus on legwork while doing laps. If your pool doesn't supply them, a board is an inexpensive and helpful tool to have. Pull buoy. This buoyancy device is placed between your legs to help you focus on upper body workouts. Fins. Swim fins help you to develop swim technique and develop stronger muscles. Paddles. Some swimmers use paddles to refine their stroke mechanics, although these tools are usually more helpful for intermediate or advanced swimmers. If you are just starting your swimming program, you may not be able to swim continuous laps in the pool. That's okay. You can use a kickboard or pull buoys to make your workout easier. For example, here are a few ways to break up lap swimming to make the swim easier. 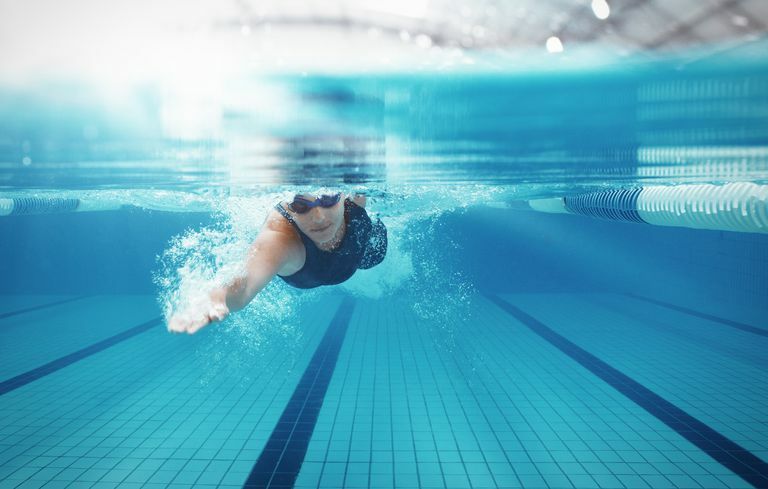 If you a recovering from an injury or you have a health condition that keeps you from doing other forms of exercise, you should check with your doctor before beginning swimming. You may still be able to swim with the assistance of paddles, a kickboard, or flippers. Keep safety in mind when you begin to swim for weight loss. Practice in a pool that is supervised by a lifeguard or swim with a friend if no supervised pool is available. Start slowly and gradually increase the duration and intensity of your workouts to gain strength, improve flexibility, and slim down.